By: Prabhjot Gill 28th October, 2008 :Punjab is synonymous with exuberance, prosperity and an intense passion for life, Punjab or ‘Panj Aab’ literally meaning five rivers, is, as it were, the very heart of the country. The lightening of lamps on festival of Diwali is a way of paying obeisance to god for attainment of peace, love, wealth, health and knowledge. And on Diwali festival night people worship God and Goddesses and place Diyas (earthen lamps) in the home, in verandahs, courtyards, and gardens, as well on outer walls and on rooftops. It is time for Pooja and tradition and also time for fun and revelry. Diwali is also the anniversary of Guru Hargobind ji being released from the prison at Gwalior Fort. In was on this day in 1619 A D. Diwali of Amritsar was out-of-the-world. Emperor Jahangir had imprisoned him along with 52 Kings. The Guru was granted freedom but refused to leave until the kings were also released. 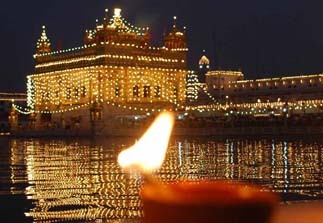 To commemorate his determination and undying love for Sikhism, people lit the way to the Golden Temple in his honour. Today, the entire Golden Temple is illuminated with traditional lamps of different colors during Diwali. The reflection of the temple in the shimmering water of the holy pool binds the eye, to the many-a-splendored pageant. Fire works display by the traditional professionals recreates the glory of the times gone past. In Punjab, Diwali Festival is the time for everyone to rejoice, looking forward to a bright future. Enthusiastically enjoyed by people of every religion, it’s magical and radiant touch creates an atmosphere of joy and festivity. Diwali, festival of lights, symbolizes the victory of righteousness and lifting of spiritual darkness. The preparations of Diwali begin well in advance. People start decorating their homes, preparing sweets, thousand of lamps are lit to create a world of fantasy. Each house entrance is made colorful with lovely traditional motifs of "Rangoli" designs to welcome Laxmi, the goddess of wealth and prosperity. In villages cattle are adorned and worshiped by farmers as they form the main source of their income. In the south, cows are offered special veneration as they supposed to be the incarnation of goddess Laxmi and therefore, they are adorned and worshiped on this day. In Punjab, winter crops are sown and the day following Diwali is celebrated as Tikka. On Tikka day, with saffron paste and rice, sisters place an auspicious mark on their brother’s forehead, gesturing to ward off all harms from her brother.